A new development in the world of marine telecommunications means faster, cheaper and further reaching broadband connectivity for superyachts that use Global Express and FleetBroadband terminals made by Intellian. "We are very pleased that these Intellian terminals have been approved for use with our FleetBroadband Xtra service," said Ronald Spithout President of Inmarsat Maritime. "I am proud that the newest service within our portfolio is gaining such momentum in the market that trusted manufacturing partners like Intellian are underwriting this with their terminals." 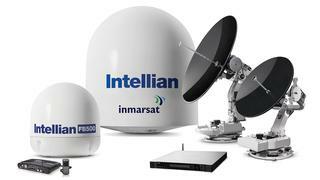 Intellian worked closely with Inmarsat to test its new VSAT terminals, which, combined with the FleetBroadband system, will live on the Global Xpress network. Intellian’s 65cm GX60 and 1m GX100 satellites, along with its FB2510 and FB500 terminals, have been approved for use with Inmarsat’s FleetBroadband Xtra. Inmarsat also promises more secure and reliable connection, whether your yacht is in the South of France or Indonesia. The Global Xpress satellites deliver higher speeds by utilising a combination of 89 fixed narrow spot beams along with six steerable beams for additional capacity. The terminals required to use this service are more compact, and the cost savings in manufacturing trickles down to the yacht owner. The compact size also means smaller, less obtrusive units and easier installation – a win for superyacht exterior design as well.